Bright Stars Nursery provide a selection of healthy menus prepared daily on our premises. 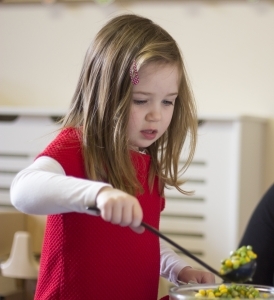 We have experienced Nursery Chefs who ensure that children are provided with healthy balanced meals prepared with good quality ingredients and plenty of fresh fruit & vegetables. Our Menus reflect the cultures of the children at the settings and include many dishes from all over the world, including recipes from families at our nurseries. The nurseries cater for a variety of dietary requirements and our chefs can prepare alternative dishes when required. Please refer to menu guides at individual nurseries for more information. At Bright Stars Nursery meal times are a social occasion with children sitting in small groups supported by a member of our staff. Children aged 2 and above are encouraged to serve themselves and pour their own drinks. We often encourage children to participate in making their own tea of sandwiches or healthy vegetable pizzas and involve them in healthy cooking activities and discussions around healthy eating. Our nursery babies are provided with pureed, semi-pureed or chopped food prepared to suit their developmental stage. Menus will be adapted to take account of cultural, religious, or dietary requirements. Children will be offered water or milk with meals and throughout the day. Where fresh fruit/vegetables appears, a selection of seasonal fruit and vegetables will be used. All our food is freshly cooked daily using the best quality ingredients. Alternatives to the daily menus may be offered if necessary.